Play this 1 minute video to meet our aquatic friends! Amazing NEW 3000 sq foot centre is the home creatures you can only see if you are a diver. 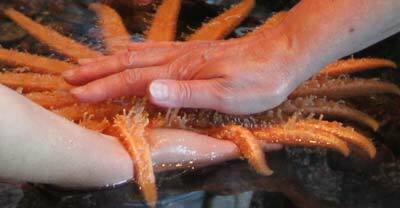 Meet fascinating intertidal and deep-sea creatures of the Pacific Rim -- up close and personal. 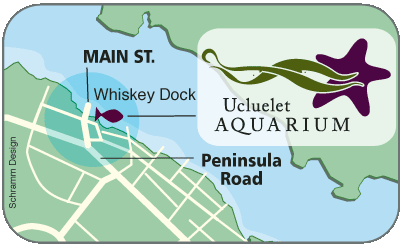 A Ucluelet must-do, especially on rainbow days (also known as as rain). 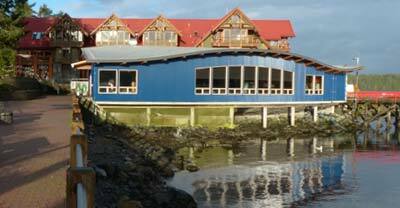 This aquarium has a unique teaching model that lets visitors of all ages meet one-on-one with creatures and learn about their special talents from an enthusiastic staff of interpreters. The Giant Pacific Octopus is especially popular to watch at feeding time. The aquarium opens on March 16th for the Pacific Rim Whale Festival and there is no time off until the late fall when all the creatures are gently released by volunteers in a popular "Release Day" event. The new aquarium is located over the water across from the village green. If you arrive by boat, the Whiskey Dock is right out front. Drive into Ucluelet (you are on Peninsula Road). Look for Davison Plaza on your right, and take the very next left onto Main St. (this is a sharp left down a steep hill towards the harbour). At the bottom of the hill (after passing the CIBC bank on your right), turn right on Cedar St. and park anywhere along the promenade. The aquarium is closed in the winter. For more information visit the aquarium website.